London - Mauricio Pochettino challenged "spirited" Tottenham to finish the job after their 1-0 win over Manchester City in the Champions League quarter-finals was marred by Harry Kane's potentially season-ending injury. Pochettino's side earned a slender first-leg advantage thanks to a clinical strike from South Korea forward Son Heung-min late in the second half at the Tottenham Hotspur Stadium on Tuesday. Much-maligned Tottenham keeper Hugo Lloris also enjoyed a sweet moment of redemption in a troubled campaign when he saved Sergio Aguero's first-half spot-kick. 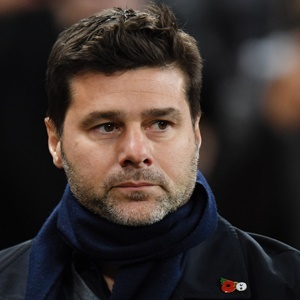 Pochettino was delighted with Tottenham's display against the Premier League champions, but he insisted the tie was still delicately poised. "We showed great quality. We were all excited and motivated to play this type of game," he said. "The energy was good, fantastic, and the penalty save gave us a big lift. "There are still 90 minutes to play and it's Manchester City. But with the spirit we play, anything is possible." Tottenham's victory was an unexpected twist after Kane injured his left ankle in a tackle on Fabian Delph early in the second half. Kane will have tests on the injury on Wednesday, but Tottenham boss Pochettino fears his star striker could miss the rest of the campaign. "It is a worry for us. We hope it is not a big issue. But there is not to much time to recover. He twisted his ankle." City had only themselves to blame for failing to earn an advantage for the second leg in Manchester on April 17. Having won the League Cup, reached the FA Cup final and kept the destiny of the Premier League title in their own hands, this was City's next hurdle in the race for an unprecedented quadruple. But City boss Pep Guardiola is adamant it is "almost impossible" to achieve a clean-sweep of all four major trophies. City's first defeat since a January 29 setback at Newcastle is not fatal to their European ambitions, but they will have to improve on this tired effort to stop Tottenham reaching their first European semi-final since 1984. "Nobody said it would be easy. We have to show what we can do in the next game," Guardiola said. "We were more in control, the second-half we didn't really concede anything. "It was a good performance but that's the Champions League. We lost, we have the second game and we will see what happens." If Guardiola was concerned about subduing Tottenham and the boisterous crowd in their new stadium, his side were handed a golden opportunity in the 12th minute. Raheem Sterling cut in from the left and left three Tottenham defenders in his wake before unleashing a shot that struck Danny Rose's raised arm as the Tottenham left-back slid in to block. However, Lloris plunged to his left to keep out Aguero's penalty with a superb save. Kane was embroiled in a physical battle with City defence's but his attempt to fight fire with fire proved his downfall in the 55th minute. The sight of the England captain, who has scored 24 times this season, limping badly down the tunnel could have been fatal for Tottenham. Yet they thrived in Kane's absence for seven matches with left ankle ligament damage earlier this season. But he alertly kept the ball in play, taking advantage of Delph's pause to protest the decision by slamming a low drive under Ederson from close range. Guardiola once infuriated Pochettino by calling Tottenham 'the Harry Kane team' - now Son has provided the perfect riposte to that jibe.